A team of scientists and engineers from the Universities of Birmingham and Bristol have returned from Guatemala where they have been teaching local scientists how to use drones to map the Fuego volcano which violently erupted earlier this year. The eruption on June 3 included pyroclastic flows (fast-moving currents of hot gas and volcanic material) which left almost no evacuation time and resulted in the deaths of several hundred people, making it Guatemala's deadliest eruption since 1929. Drones are revolutionising volcanology, provided unprecedented access and data without risking life and limb. Supported by the World Bank and the British Embassy in Guatemala, the team have been assisting volcanologists at Instituto Nacional de Sismología, Vulcanología, Meteorología e Hidrología (INSIVUMEH), the Guatemalan government agency responsible for monitoring volcanoes. Guatemala has limited resources to monitor its active volcanoes and is reliant on overseas support and collaboration. The local scientists took part in a four-day workshop led by Dr. Rick Thomas, from the University of Birmingham's School of Geography, Earth and Environmental Science. They were trained in safe flight protocols, data acquisition and image processing using quadcopters and 3-D modelling software supplied by Agisoft. Dr. Thomas said: "Flying commercial quadcopters is generally very easy, but flying them safely, legally and repeatedly for scientific purposes is more challenging. This workshop shared knowledge and practices developed for repeated safe drone flying to enable the regular production of high quality 3-D maps in difficult terrain. By building this capacity within INSUVUMEH we hope their scientists will have an improved capability to assess risks for the benefit of the local population." 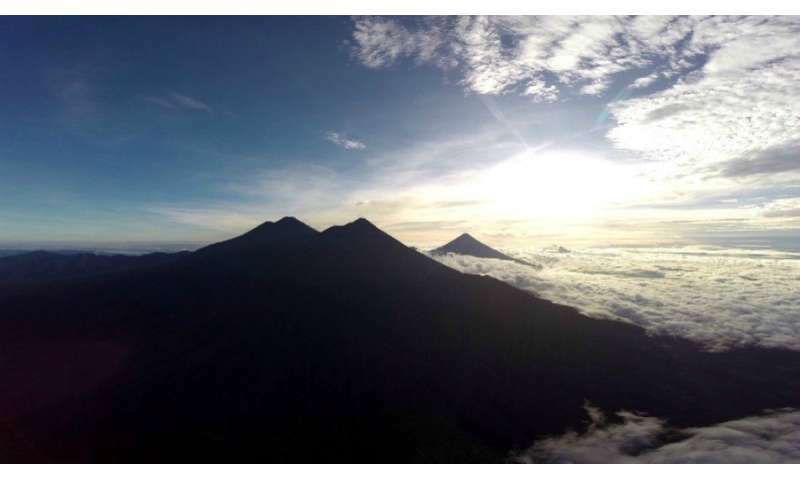 In conjunction with this work, and integrating with the Guatemalan air traffic control (DJAC), the team also flew larger, fixed-wing drones over the summit of Fuego volcano, at a University of Bristol record altitude of 14,500 feet above sea level. They imaged the summit and were able to predict when and where the next paroxysmal eruption would occur with considerable accuracy. Chief engineer Dr. Thomas Richardson, from the University of Bristol's Department of Aerospace Engineering, said: "Flying drones at this altitude and remotely is a real challenge and it is incredibly rewarding to help colleagues in Guatemala make observations of the crater that would otherwise not be possible." Funded by CASCADE, an EPSRC Programme grant, the team will be returning to Guatemala early next year to continue their work – and have plans for placing sensors on the top of Fuego, multi-vehicle operations and night flights. Dr. Matt Watson, from Bristol's School of Earth Sciences, added: "This is an incredible opportunity to help others in Guatemala, especially after the tragic events of June 3. "Collaboration between scientists and engineers makes this possible – engineers are capable of realising scientific desires; between us we can take new and exciting observations and measurements to assist with understanding and prediction of volcanic risks."